In a further boost to efforts of closing the economic divide between its rich and poor, Brazil has lifted 3.5 million people out of poverty and more than a million out of extreme poverty in 2012. 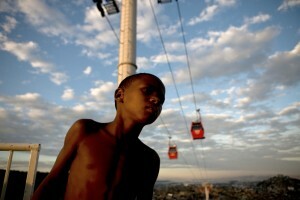 The data was made available by a new report released Tuesday by Brazil’s Institute of Applied Economic Research (IPEA). The report says the number of poor living on $1 or $2 per day, decreased from 19.1 million to 15.7 million, while the number of Brazilians living in extreme poverty went down from 7.6 million to 6.5 million. The report also shows income gap narrowed in 2012, and the per capita income for households in the poorest 10 per cent of the population increased by 14 per cent. IPEA President Marcelo Neri attributed the poverty reduction to accelerated income growth among people at the base of the social pyramid. The piece of “the pie [graph showing income distribution] increased with greater energy for the poorest,” said Neri. President Dilma Rousseff had in February this year raised the monthly stipend of 2.5 million people living below the poverty line. “We are turning the page on our long history of social exclusion that had perverse roots in slavery,” President Rousseff had said after signing the decree. The main indicator of income growth is access to durable goods like televisions, refrigerators, and washing machines as well as essential public services such as electricity, garbage collection and running water. The report notes that the improvement in quality of life among the poor is a direct result of wage increases and social programs. About 54.9 per cent of inequality reduction from 2002 to 2012 was due to increased wages, while 12.2 per cent was due to government benefits, according to IPEA. Brazilian flagship social welfare programs like Brasil Sem Miséria and Bolsa Família, have brought millions out of poverty. A recent economic slowdown has dogged the Rousseff administration, who reacted to some of the more strident criticism including a scathing report by the London publication The Economist earlier last week. “We are the third fastest growing economy of the world in the second quarter. Who bets against Brazil, always loses,” Rousseff tweeted recently. The Economist report about a ‘failed economy’, claimed “the markets do not trust Ms Rousseff” referring to the Brazilian president as too “interfering”. The opposite of U.S. Republican economic policies. Investing in people’s welfare benefits all.